So I just purchased NewsRack, after seeing so many good reviews and posts about it. 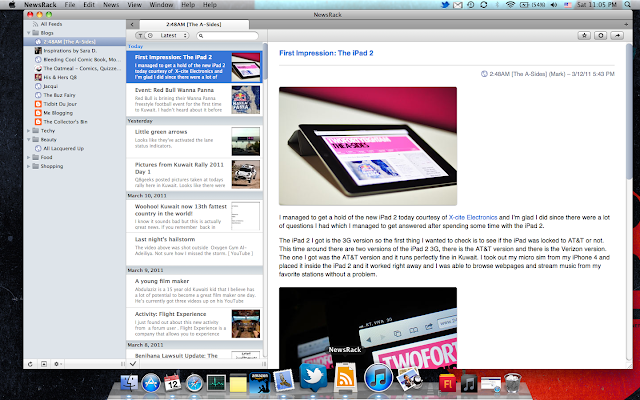 It's a great RSS reader, with a very user friendly interface. It basically lets you add all the blogs, websites, news, music & entertainment feeds you follow, and updates it automatically whenever a new post is out. You can also sync it with google reader. At $6.99, it's not the cheapest app out there but I think it's worth it. They also have an iPhone and an iPad app (it was originally made for the iPhone) selling at $4.99.